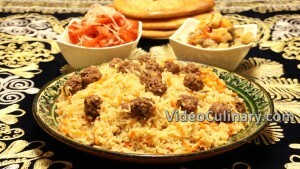 Plov is the national dish of Uzbekistan. There are many variations of Plov – it can be made with beef, lamb or chicken. 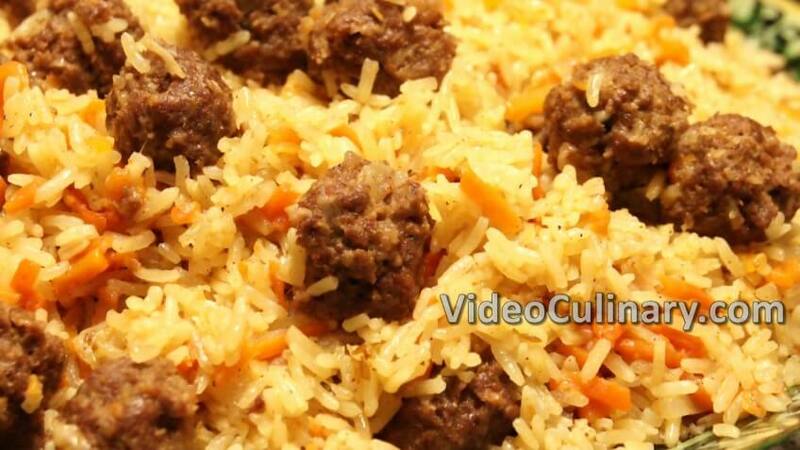 This recipe offers a modern version of Plov with meatballs. 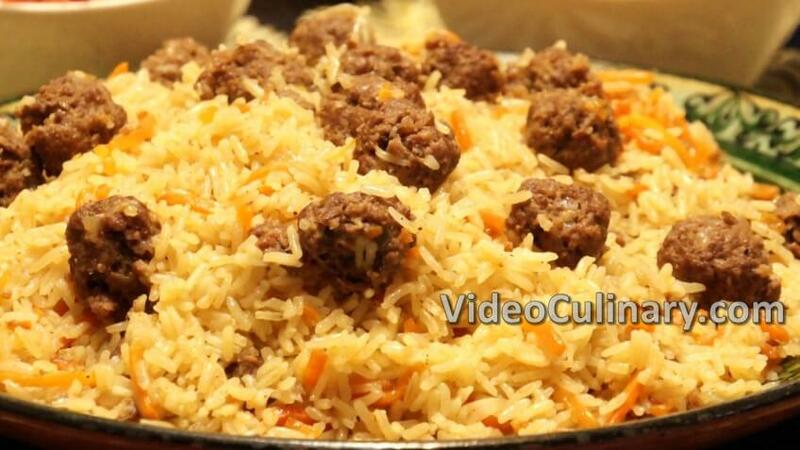 It is quicker to make than the traditional Plov, and it is very delicious. Peel and wash 500 grams (18 oz) of onion. Cut 250 grams (9 oz) into rings, and small dice 250 grams (9 oz). Pass 1 kg (2.2 pounds) of beef through a meat grinder. 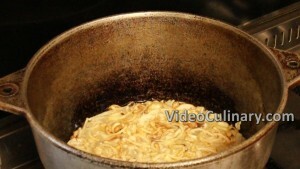 Add 1 teaspoon of salt, 1 teaspoon of cumin, 1 teaspoon of ground black pepper and mix. Add the small diced onion and mix. 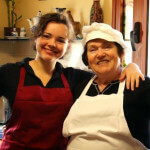 Lightly oil your hands, and make walnut sized meatballs. Arranged on a tray lined with parchment paper and lightly brushed with oil. Place in the refrigerator. 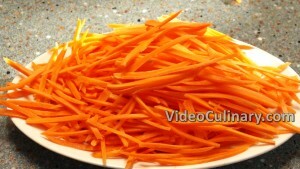 Peel and wash 600 grams (21 oz) of carrots Cut into 4 mm thick long strips. Heat 300 ml (10 oz) of vegetable oil over high heat until smoking hot. 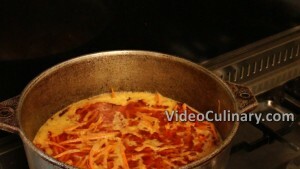 Add the onion and fry until golden, add the carrot and stir. Add 1 teaspoon of black pepper, 5 teaspoons of coarsely ground cumin and 1 or 2 teaspoons of sweet or hot paprika, and stir. Add 1.8 liters (1.9 quarts) of cold water. 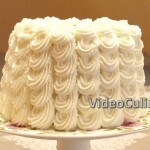 Bring to boil, add 5 teaspoons of salt and 1 teaspoon of sugar. 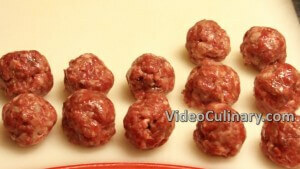 Remove the meatballs from the fridge, and add to the pot. 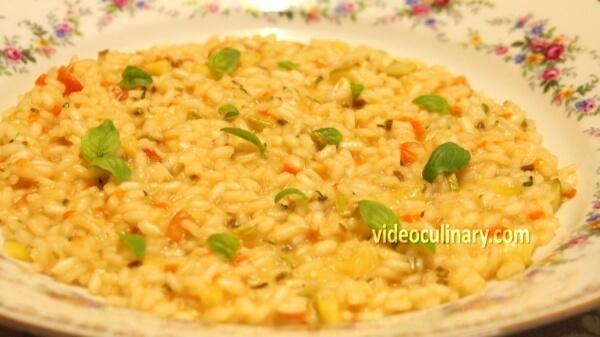 Bring to boil, and simmer over low heat. Wash 1 kg (2.2 pounds) of rice (we used jasmine rice) in cold water, changing the water 4-5 times, until the water runs clear. 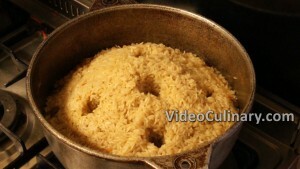 Drain the rice in a sieve, Gently add into the broth and flatten the surface of the rice. turn the heat on high, bring to boil and let all the water evaporate. 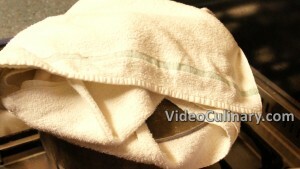 Cover the pot with a towel and a lid and cook over very low heat. 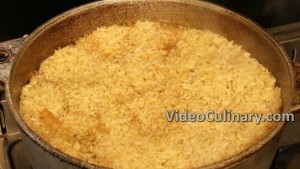 Cooking time depends on the rice variety; it could take from 20 to 40 minutes. 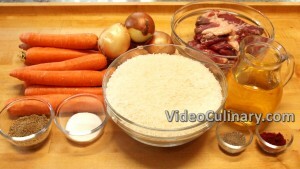 When done, remove from the heat and let the plov rest, covered, for 5 minutes. 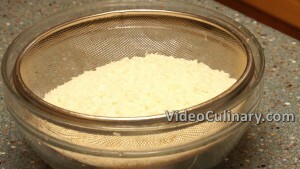 Uncover, fluff the rice, rest for another 5 minutes and transfer to a serving plate. 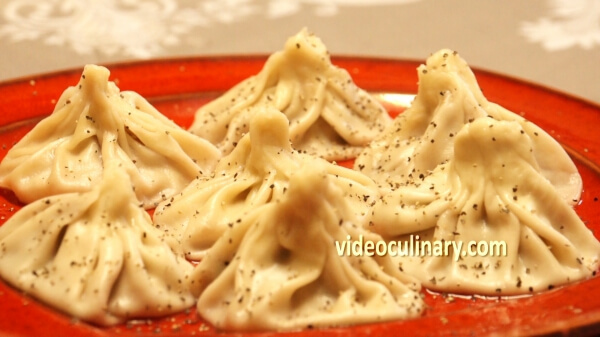 Serve with quick Uzbek flat bread.